Kitti Suwanratchatamanee, Mitsuharu Matsumoto, Shuji Hashimoto, "Haptic Sensing Foot System for Humanoid Robot and Ground Recognition with One Leg Balance", IEEE Transactions on Industrial Electronics, Vol.58, No.3, pp.3174-3186, 2011. 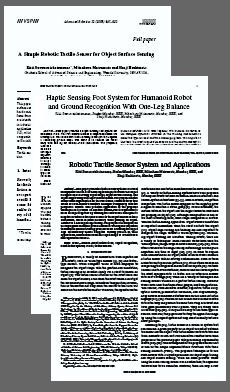 Kitti Suwanratchatamanee, Mitsuharu Matsumoto, Shuji Hashimoto, "Robotic Tactile Sensor System and Applications", IEEE Transactions on Industrial Electronics, Vol.57, No.3, pp.1074-1087, 2010. Kitti Suwanratchatamanee, Mitsuharu Matsumoto, Shuji Hashimoto,"A simple robotic tactile sensor for object surface sensing", The International Journal of RSJ (Robotics Society of Japan), Advanced Robotics, Vol.22, No.8, pp.867-892, 2008. Kitti Suwanratchatamanee, Mitsuharu Matsumoto, Shuji Hashimoto,"Balance Control of Humanoid Robot in Object Lifting Task with Tactile Sensing System",The 4th IEEE International Conference on Human System Interaction (HSI-2011), pp.431-436, Keio University, Yokohama, Japan, May 19-21, 2011. Kitti Suwanratchatamanee, Mitsuharu Matsumoto, Shuji Hashimoto, “Human-Robot Interaction: Balance Control of Humanoid Robot with Tactile Sensing System in External Forces”, The 7th International Conference on Ubiquitous Robots and Ambient Intelligence (URAI-2010), pp.7-11, BEXCO, Busan, Korea, November 24-27, 2010. "Awarded the Best Paper"
Kitti Suwanratchatamanee, Mitsuharu Matsumoto, Shuji Hashimoto,"A Research Regarding Development and Application of Tactile Sensing for Robots", The International Symposium on Frontier Research in Micro-Nano Systems and Mecha- tronics-(ISFR-2010), pp.6, Nagoya University, Nagoya, Japan, November 11, 2010. Kitti Suwanratchatamanee, Mitsuharu Matsumoto, Shuji Hashimoto, “Walking on the Slopes with Tactile Sensing System for Humanoid Robot”, The 8th International Conference on Control, Automation and Systems (ICCAS-2010), pp.350-355, KINTEX, Gyeonggi-do, Korea, October 27-30, 2010. "Awarded the Outstanding Paper"
Kitti Suwanratchatamanee, Mitsuharu Matsumoto, Shuji Hashimoto, "Tactile/ Haptic Sensing System for Autonomous Humanoid Robot", The IEEE 2009 International Student Experimental Hands-on Project Competition via Internet on Intelligent Mechatronics and Automation (HCIMA-2009), Internet conference/competition, December 5, 2009. "Selected Finalist 10 Teams"
Kitti Suwanratchatamanee, Mitsuharu Matsumoto, Shuji Hashimoto,"Balance Control of Robot and Human-Robot Interaction with Haptic Sensing Foots",The 2nd IEEE International Conference on Human System Interaction (HSI-2009), pp.68-74, Catania, Italy, May 21-23, 2009. "Awarded the Best Paper (in the area of Intelligent systems)"
Kitti Suwanratchatamanee, Mitsuharu Matsumoto, Shuji Hashimoto,"A Simple Tactile Sensing Foot for Humanoid Robot and Active Ground Slope Recognition", The 5th IEEE International Conference on Mechatronics-(ICM-2009), CD-ROM, ISBN:978-1-4244-4195-2, Malaga, Spain, April 14-17, 2009. Kitti Suwanratchatamanee, Mitsuharu Matsumoto, Shuji Hashimoto, "Tactile/ Haptic Sensor for Robots and Applications", The IEEE 2008 International Student Experimental Hands-on Project Competition via Internet on Intelligent Mechatronics and Automation (HCIMA-2008), Internet conference/competition, December 7, 2008. "Won 3rd-Prize Award"
Kitti Suwanratchatamanee, Mitsuharu Matsumoto, Shuji Hashimoto, "A novel tactile sensor torch system for robot manipulator and object edge tracking", The 34th Annual International Conference of the IEEE Industrial Electronics Society 2008-(IECON-2008), pp.2617-2622, Orlando, Florida, USA, November 10-13, 2008. Kitti Suwanratchatamanee, Mitsuharu Matsumoto, Shuji Hashimoto, "Human-machine interaction through object using robot arm with tactile sensors", The 17th IEEE International Symposium on Robot and Human Interactive Communication-(RO-MAN-2008), pp.683-688, Munich, Germany, August 1-3, 2008. Kitti Suwanratchatamanee, Mitsuharu Matsumoto, Shuji Hashimoto,"A tactile sensor system for robot manipulator and continuous object edge tracking", The 7th of France-Japan (5th Europe-Asia) Congress on Mechatronics-(Mecatronics-2008), CD-ROM, Le Grand-Bornand, France, May 21-23, 2008. Kitti Suwanratchatamanee, Mitsuharu Matsumoto, Ryo Saegusa, Shuji Hashimoto, "A simple tactile sensor system for robot manipulator and object edge shape recognition", The 33rd Annual International Conference of the IEEE Industrial Electronics Society 2007-(IECON-2007), pp.245-250, Taipei, Taiwan, November 5-8, 2007. "Awarded Student scholarship"
Kitti Suwanratchatamanee, Mitsuharu Matsumoto, Shuji Hashimoto,"Object Surface Tracing Using Single Tactile Sensing Element for Industrial Robot", "単一圧力 センサからなる触覚デバイスを搭載した産業ロボットによる物体表面形状の推定", The 28th Annual Conference of the Robotics Society of Japan-(RSJ-2010), CD-Proc., AC3F1-7, Nagoya, Japan, September 22-24, 2010. Kitti Suwanratchatamanee, Mitsuharu Matsumoto, Shuji Hashimoto,"Balance Control Using Embedded Tactile Sensing Feet System for Humanoid Robot", "足底触覚システムによるヒューマノイドロボットのバランス制御", The 27th Annual Conference of the Robotics Society of Japan-(RSJ-2009), CD-Proc., AC3H3-01, Yokohama, Japan, September 15-17, 2009.